Saturday started off so nicely and then it sort of went down hill from there. We wanted to do something fun this weekend, so it was decided to go mining. The question was where – North Carolina or Georgia. After poking around online, taking some recommendations from a friend and then finally just deciding, we were off to North Carolina. It is was pouring when we left the house but as we headed up to the mountains all we had were some clouds to deal with. We were heading towards Rutherfordton, NC, and we were full of excitement. 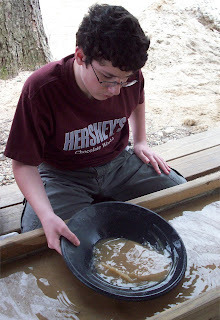 The boys love to go gem mining, we have done twice before but this time we were going with the hope to find gold! 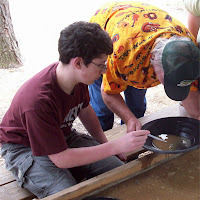 There are quite a few gold mines and gem mines all over the area in North Carolina. Finally, after an hour and forty minutes we were in Rutherfordton, now to find a mine. We drove through town (which was really quaint) to see where the mines were located. Once found, we opted to head back to town and grab something to eat. The food we had from Legal Grounds was so yummy and the building inside was so cool! 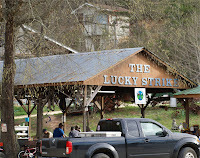 Once we were fed, off we went for a day of mining at The Lucky Strike Mine. We purchased our bag of ore (gem bag for me), had a quick lesson on how to pan and then we were on our own. Nate (Mr. no patience) had all the patience in the world to find gold and wouldn’t you know he was the one to find it first! Steve (a local gentleman) who was at the mine was giving Nate all these wonderful pointers on what to do. <--This is Steve helping Nate place his gold into a bottle. <--- Spencer getting ready to do some panning. Towards the end of the day DH found a really nice tiny nugget of gold, too cool! I had found some Citrine, Garnets, and Amethysts. Looks like I need to take out the boys little tumbler and see what they look like cleaned up a bit. Dh & Nate climb up the hill from where we are to get signal for the cell phone. Spencer and I stick with the car and I keep trying to get the key out. They return with news that a tow truck will be coming in a bit over an hour and Mr. D (a friend) was on his way to help us out. The two truck came down and they began to check out the car. They found that the battery terminal was broken off and battery acid was all over the inside of the engine. 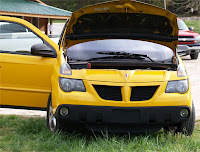 The thought was that if we replace the battery it should be alright; first the guys had to take it back to their shop. The car was loaded onto the flat bed and we piled into Mr. C’s car. Off we went, another fifteen minutes up the road to the shop. Once there, we were told to go grab some dinner while they unload the car and looked at it. Right as dinner was served the phone rang, and we were told it was the battery; we just needed to pick one up. Quickly we ate, picked up a battery and zipped back to the garage. They placed the battery in and she started right up! Woo-hoo, we could finally get home to the dogs. I was pretty sure they were sitting by the door with their little legs triple crossed wondering where we were. Mr. C showed us a way home that would cut some time off, which was really wonderful It has been a long time since we were out on country roads, and needing to watch for deer. (Not that we live in a huge city or anything. We have turkeys that come through now and again.) Anyway, we were zipping along and the next thing I see is a deer charging down a side of a hill. That’s it, I thought to myself. He is going to hit us and it will be in the back by the kids. Instead of saying, “deer!” I simply screamed. If DH would have hit the brakes or slowed down, we would have had an issue. Our trip home just zipped along after that and finally, we were on the highway heading home. We rolled into the driveway at 10:30pm, tired, frazzled and thrilled to have found some gold.